Siriol Sherlock made her name as a botanical artist, exhibiting widely, teaching and writing books on the subject. 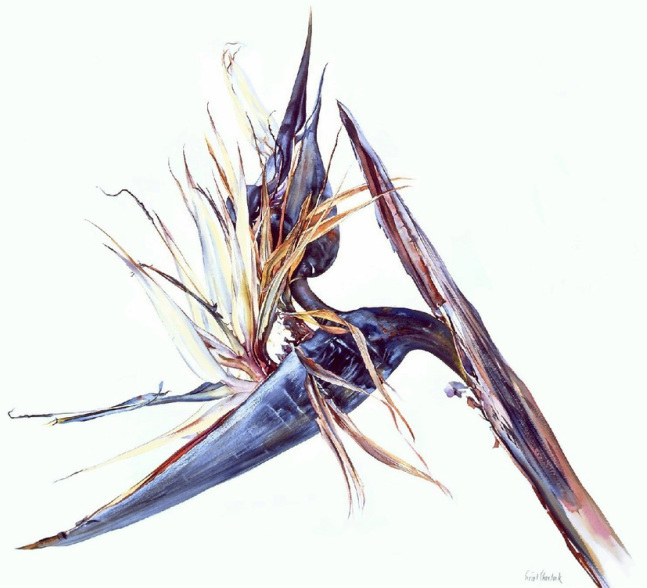 She is widely recognised as one of the world's top contemporary botanical artists. In recent years family life and 'other large projects' have taken over and very little of her work has been exhibited for a decade. She has, however, been 'keeping her hand in' with occasional commissions and plenty of teaching. She has recently built a proper art studio in her garden in Hampshire and is feeling inspired to work whenever there is time - although, as all artists know, there is never enough time - unless you become obsessed at the cost of everything else in your life and become 'a Van Gogh'. She is slowly getting back to work - albeit with less of the botanical illustration and more experimental new work because, in Siriol's words, "I don't seem to have the time or the patience for botanical illustration that I used to. Watercolour will always be my first love and where my main expertise lies, but I am currently enjoying the new challenges of working with different media - in particular oils and feltmaking. Colour, light, contrast and the beauty of our amazing natural world have always been the main inspiration behind my work and continue to inspire my new work." From 2012 to 2018 Siriol gave up painting and was behind an exciting arts initiative in Hampshire. Rum’s Eg (Old English name for Romsey) was a contemporary gallery and Arts space in Bell Street, Romsey run as a social enterprise by Hampshire Art & Craft CIC to support artists and makers whilst educating and engaging the public in art and craft. It was opened in 2012 to add to the attractions of this heritage market town as an accessible, affordable gallery with a café and education spaces. The gallery represented over 150 talented Artists & Craftsmen working or living within 70 miles of Romsey and became a renowned centre of excellence in the South of England – helping to conserve the rich and varied art and craft of this region by encouraging public awareness, education and participation and providing creative opportunities for all ages, abilities & walks of life. ‘Arts for Wellbeing’ community projects were facilitated and supported by HA&C CIC. Very sadly Rum's Eg was not able to secure Arts funding for further development and was not resilient enough to withstand difficult trading in the first half of 2017 plus the closure of Bell St for street enhancements from September 2017 to May 2018. However, our legacy lives on in various forms such as Prescription Arts Test Valley https://www.prescriptionarttestvalley.org. As a result of this, Siriol currently has practically nothing to sell and needs to get painting again! !